Friday afternoon my Mom called to tell me a dear friend of ours has been diagnosed with breast cancer. And, being the quilter that I am, I ran straight to my stash. Oh yes, she must have a quilt! I had a stack of 5″ pink charm squares, and this is what I did with them. Started on this yesterday morning, by early afternoon today, it was a completed flimsy. I can’t wait to watch it be transformed by the quilting. I’m hoping to squeeze it in, for a quick panto, between the customer quilt that is on the machine, and the next one in line, so I can get it bound, labeled and off to our friend. I am going to estimate that I busted 4 yds in the top. No new fabric in this week. 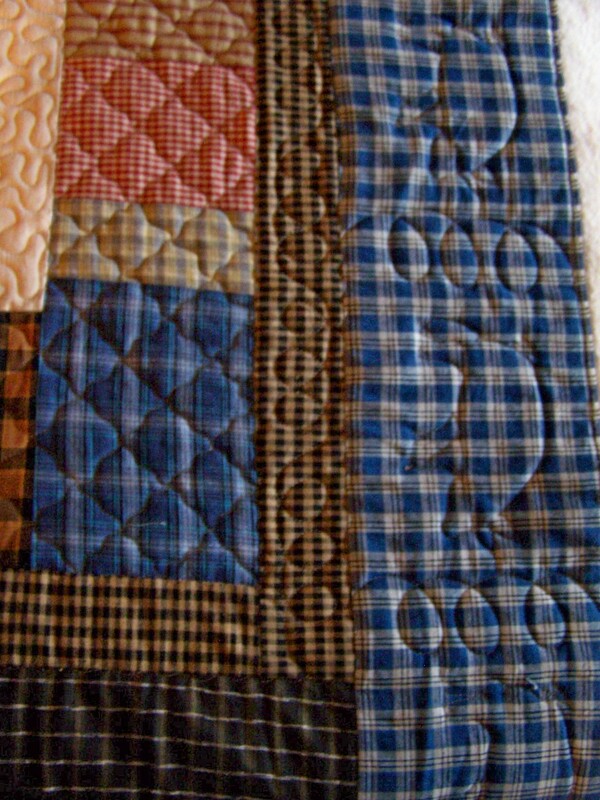 Speaking of customer quilts…the next one in line is soooooo cute! It is appliqued “Chubby Chicks” in cute colors. I will enjoy working on it. I will be blogging it, so it’s owner can check in on it. I just hope I do it justice! Right now I am quilting appliqued pigs. I really started second guessing my quilting choices a little over halfway through, and had a mini meltdown. I took it off the machine to turn and repin it, so I could quilt the last two borders more easily, and took a some pics before I put it back on. I think it helped to be able to step back and see the whole quilt at once. I’m sure I will worry about it a bit, until I get to hand it back to it’s owner and get her reaction. I’m such a worry wart about that. And it’s usually the quilts that I think will be the easiest. Somewhere in the process, my confidence takes a hike, and in comes self-doubt and second guessing, and “oh my God, I’m a failure” thoughts. Hopefully, she will love it and all my worry will have been for nothing. Time will tell. And these are my pretty new flowers that my hubby brought home Friday, to plant in my flower bed. 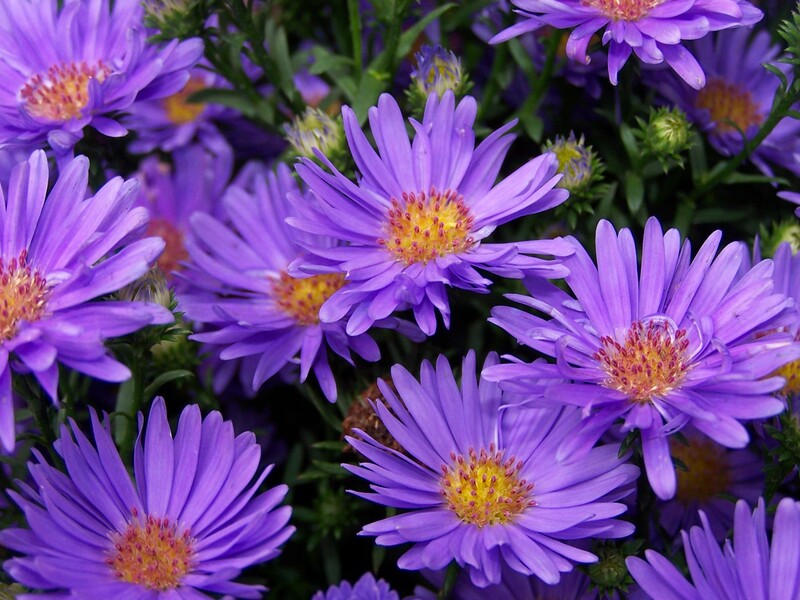 Purple asters…I love them! Tomorrow, I’m off to Amarillo for the yearly “female” doctor visit. Yucko! Hope your Monday is better than that. I love the purple asters! Too bad the season here is so short for them. You can quilt my quilts for me anytime. The pigs are fantastic and I’m sure the owner will love it too. The colours of the asters are very vibrant. Makes me want to go out and plant some. beautiful flowers…the pig quilt is fabulous…quit worrying! I think the pig quilt turned out great! Love the flowers too. whoopee! 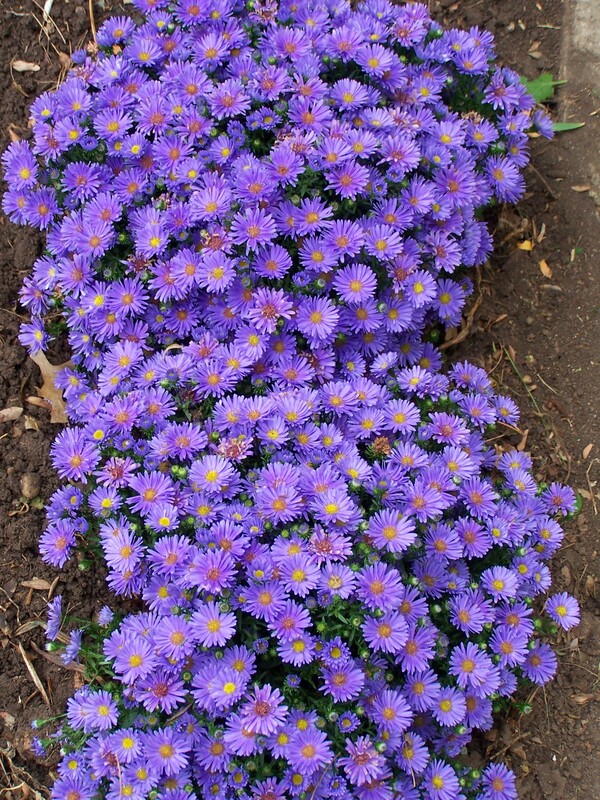 Neon bright asters –just the autumn pick-up to finish off the tattered end of summer-itis. 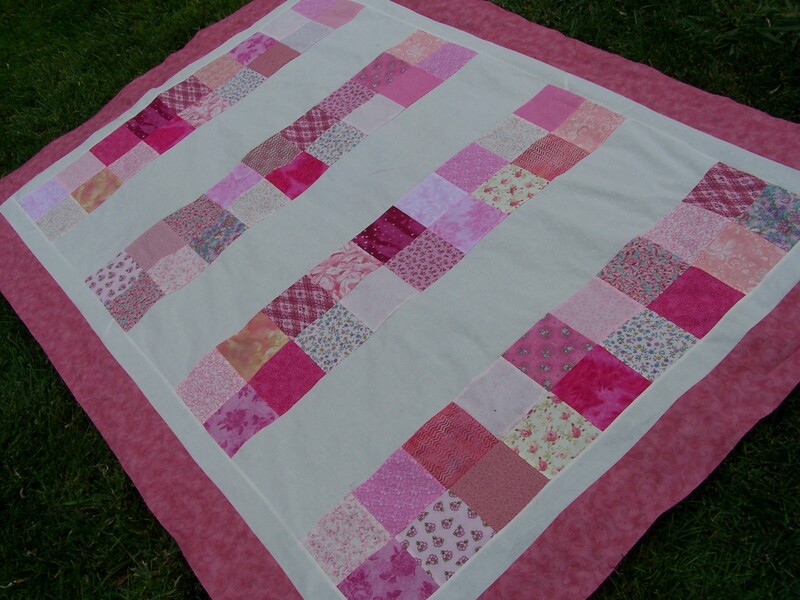 The piggie quilt is so cute! You did a great quilting job. What’s not to like! What a sweetheart to make the quilt for your friend. I hope all is well with her, and know this quilt will be a wonderful gesture of friendship and prayers for her. Be sure to add a label & include your name along with your Mothers. LOVE the pigs in the border…nice touch! 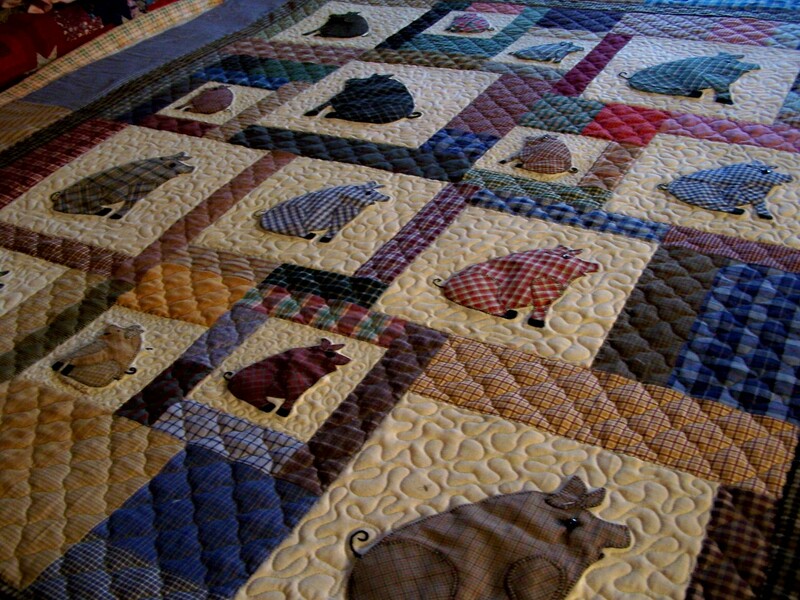 I love the quilting on the pig quilt – well done! I haven’t seen a flimsy you didn’t do justice to! Your quilting is wonderful. I love those pigs! Have a great week. ditto what everyone has already said. love it all! Flowers are beautiful and hope your doctor visit went well. The pigs are way too cute and prayers for your friend during her upcoming journey! Randi!!! It’s lovely to hear from you!!! I love that pink quilt, and that pig quilt is so adorable!! « The center is complete!